Beyond the Pillars is a rare photograph, a snapshot in time, of late Eighties melodic hard rock and heavy metal, centered around James Byrd's talented guitar playing. Though all the pieces are a showcase for his neo-classical style, they are first well-rounded songs. You'll find some songs that remind of that quintessential 80's melodic metal with a rock groove as on I Don't Believe in Love, On My Mind, or Let It Out. Byrd/Krumins dabble with an interesting melodic power metal motif on Chasing the Shadows. They also offer two classic rock/metal ballads on the acoustic guitar driven Angel of Mercy and the more traditional Gotta Find You. The album closes with the instrumental Requiem Atlantis where Byrd exercises his exceptional guitar skills across both acoustic and electric avenues. 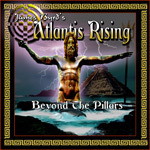 With these notes, I've also listed the best tracks on Beyond the Pillars. The remainder of the songs, while still good, were a little lackluster. Nevertheless, Byrd's guitar technique is sound throughout, where solos exist they abound in energy. But it's not all fret board twiddling on this disc. Krumins, enthusiastic and passionate throughout, gets are real opportunity to display his vocal talent on the interesting, and different, piece Waiting in the Shadows. While rough and raw, James Byrd's Beyond the Pillars is still an interesting and entertaining glimpse into late Eighties melodic hard rock and metal driven by exceptional guitar work and strong vocals. While rough and raw, James Byrd's Beyond the Pillars is still an interesting and entertaining glimpse into late Eighties melodic hard rock and metal.